The Kagu (French: Cagou), Rhynochetos jubatus, is a long-legged blue-greyish bird endemic to the dense mountain forests of New Caledonia. It is the only surviving member of the family Rhynochetidae, although a second, larger species of the genus Rhynochetos, the Lowland Kagu Rhynochetos orarius, has been described from Holocene subfossil remains It is almost flightless, and builds a ground nest of sticks, laying a single egg. It has proved vulnerable to introduced rats and cats, and is threatened with extinction. The remote habitat and rarity of this species mean that little is known of its habits. 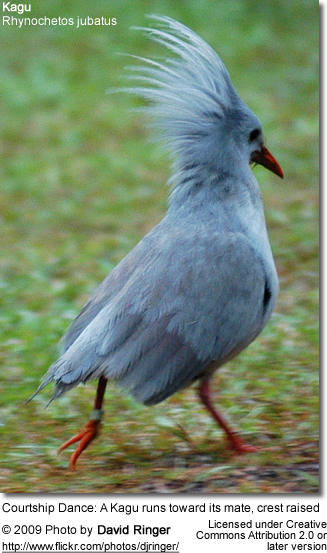 The Kagu is a ground-living bird about the size of a chicken found in the forests and shrubland of New Caledonia. Its plumage is unusually bright for a bird of the forest floor; ash-grey and white colored. It possesses powder downs which help keep it dry and insulate it in New Caledonia's tropical climate. It uses its crest to display to other members of the species (please refer to photo below). It is nearly flightless, using its wings for displays (its primary wing feathers are patterned), and for moving quickly through the forest. It can also use them to glide when fleeing danger. The wings are not reduced in size like some other flightless birds, but they lack the musculature for flight. It possesses bright red legs and a similarly colored bill, and has large eyes, positioned so that they give good binocular vision which is helpful in finding prey in the leaf litter and seeing in the gloom of the forest. There is little sexual dimorphism (visual physical differences between the sexes) beyond a difference in the amount of barring in the primary feathers. It possesses 'nasal corns', structures covering its nostrils, which are a feature not shared by any other bird. It is these structures that gave the species its generic name, Rhynochetos, which is derived from the Greek this meaning nose and chetos meaning corn. Another unique characteristic of the species is that has only one-third the red blood cells and three times the hemoglobin per RBC compared to the usual situation in birds. Kagus make a range of different sounds, most commonly duetting in the morning, each duet lasting about 15 minutes. The Kagu is exclusively carnivorous, feeding on a variety of animals with annelid worms, snails and lizards being among the most important prey items. Also taken are larvae, spiders, centipedes and insects such as grasshoppers, bugs, and beetles. The majority of the diet is obtained from the leaf litter or soil, with other prey items found in vegetation, old logs and rocks. Sometimes Kagus will hunt small animals in shallow water. Their hunting technique is to stand motionless on the ground or from an elevated perch, and silently watch for moving prey. They may stand on one foot and move the leaf litter with the other foot in order to flush prey. 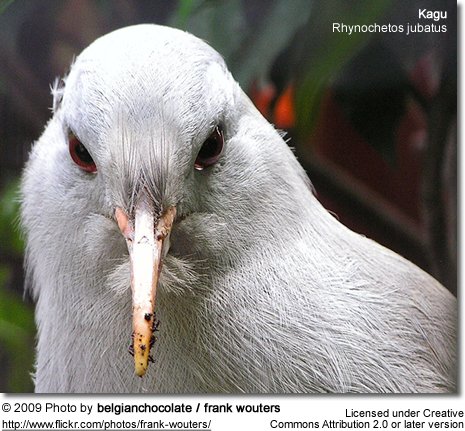 Kagus are monogamous breeders, with pairs holding exclusive territories of around 10-28 ha. A simple nest is constructed, which is little more than a heaped pile of leaves, although in some cases the egg may be laid directly on the ground. The nest is not concealed but is usually adjacent to a tree trunk, log or low vegetation. A single grey slightly blotched egg is laid which weighs 60-75 g. incubation duties are shared by the parents. Each bird will incubate the egg for 24 hours, with the changeover occurring around noon each day. During each incubation stint the parent will remain on the egg the whole time except early in the morning, when the bird will briefly move away to call to its mate and occasionally forage quickly. The incubation period lasts for 33-37 days, which is long for the size of the egg. The pairs are aided in raising chicks by older offspring who may remain in their parents territory for many years after fledging. Concern was first raised about the future of the Kagu in 1948. It is threatened by the introduced cats, pigs and dogs. New Caledonia lacked mammals prior to the arrival of humans (except for bats), and many insular species have been negatively impacted by introduced mammals. Rats have a big impact on nestlings, accounting for 55% of nestling losses. The first concrete evidence for the effect of dogs came when a New Zealand researcher's study population was quickly exterminated by dogs in the 1990s, although suspicions about the importance of dogs and other predators had been voiced prior to this and dog control measures had been enacted in some areas in the 1980s. Its initial decline was caused by hunting for the pot, and by keeping as pets. They also suffer from habitat loss, caused by mining and forestry. 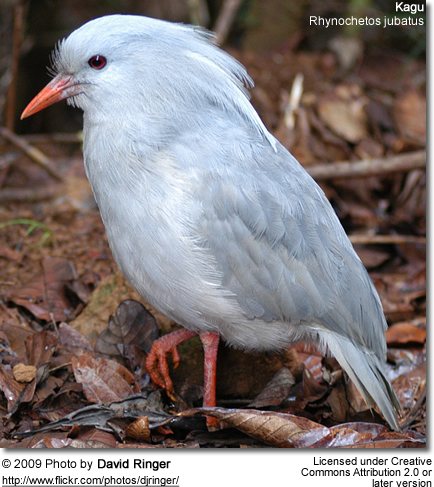 The Kagu is listed as endangered (CITES I), and enjoys full protection in New Caledonia. It has been the subject of highly dedicated conservation efforts, and is receptive to ex-situ conservation, breeding well in Nouméa Zoo. It is also doing well in Parc Territorial de la Rivière Bleue, which has a pest management programme and has been the site of releases into the wild of the captive bred birds. 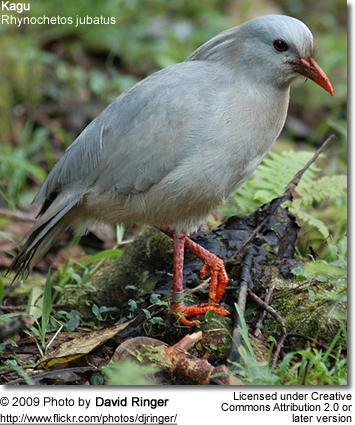 Kagus are considered very important in New Caledonia, it is a high profile endemic emblem for the Territory. Its distinctive song used to be played to the nation every night as the island's TV station signed off the air. Its survival is considered important for the nation's economy and image. Copyright: Wikipedia. This article is licensed under the GNU Free Documentation License. It uses material from the Wikipedia.org.